As we get ready to celebrate Gold Coast magazine’s 50th anniversary in April, one of the reflections over the decades is the decline of The Miami Herald. When we arrived in 1970, the Herald set the agenda for Broward County, and much of the state. It had several offices outside Miami, including a major presence on Sunrise Boulevard near Holiday Park. It routinely out-covered the Fort Lauderdale News (now Sun-sentinel) in Broward. 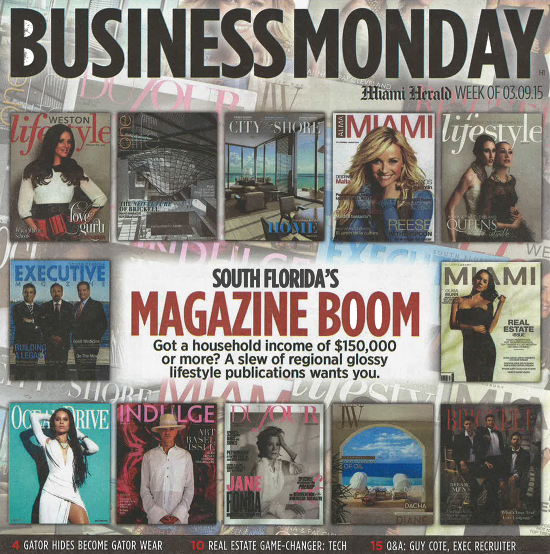 Those days are long gone, and there is no better example of that than yesterday’s Herald Business Monday section, which had a cover story on the explosive growth of glossy regional magazines in South Florida. True enough. In 1965, there were only two such magazines – ours and Palm Beach Life, which is still published occasionally by Cox Newspapers, owner of the The Palm Beach Post. Today, between Miami and Vero Beach, there are at least 40 lifestyle magazines, including six of Gulfstream Media Group’s. We aren't complaining too loudly because our related company's software package, The Magazine Manager, goes to hundreds of regional magazines, many much like ours. And, in addition to our six print publications, all lifestyle magazines have a large digital and social media presence. Monday’s Herald story mentioned numerous publications and listed various companies active in the field. But indicative of its lack of attention to Broward County, it did not mention us – the oldest and most successful magazine publisher in the area. We suspect that the writer, Cindy Krischer Goodman, may not even know we exist. If she has ever seen a copy of Gold Coast, Fort Lauderdale Monthly (our visitors version), Boca Life Magazine, The Palm Beacher, Jupiter Magazine or Stuart Magazine, she probably did not take the trouble to see who published them. In a story that mentioned so many titles and companies (it took up four and a half pages), it seems an inexcusable lack of leg work. One can’t imagine the old Herald being so irresponsible. Example: Goodman called Ocean Drive the “grandfather” of local magazines. It started around 1990, a mere 25 years after Gold Coast. We wonder if Goodman looked into the mentioned magazines' circulations. We doubt many other publications come remotely close to our recent postage bill for one issue – $17,481. And we know exactly who gets those copies. In contrast, so many of the new glossies drop off copies to advertisers and then stack up the rest of their free publications in restaurants and bars. We know our readers’ profiles in detail. What does a stack-up publication know, except that some drunk may have walked out with a copy of their book? Many people ask us why there are so many magazines. The answer is that technology has made them easy to start, and too few advertisers demand proof of circulation. The Herald would do the advertising community and readers in general a real service if it took the time to ask some questions.